Organisations with a field-based workforce need a mobile strategy in order to unlock the opportunity of IoT and realise real cost and brand benefit. Getting it wrong is not an option, so have you looked at the complete picture? If you have made the decision to invest in mobile technology for your field workforce, the question now is which device do you buy? Initially, the offers available from consumer smartphone providers may seem tempting – they come at reasonable prices and offer entertainment and some business functionality, so why not? What is there to worry about when it comes to using consumer-grade smartphones? 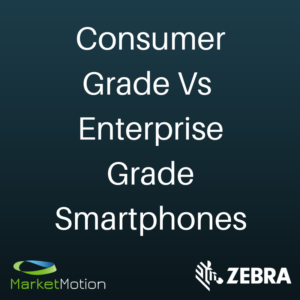 After carrying out research into how businesses rated the success of their mobile workforce strategy, Zebra discovered that those who had invested in consumer technology were experiencing a wide range of problems. In fact, the respondents to our survey have experienced an average of over 2 issues with an off-the-shelf device. This blog aims to explore the results of this research in a little more depth, highlighting the main issues companies experience with consumer technology and offer expert advice on how you can ensure you don’t encounter the same problems. The top three issues our research revealed were security, battery life and robustness. 61% of respondents were worried that the security capabilities of consumer devices may not be sophisticated and reliable enough to ensure enterprise data is protected. Ultimately, when your field service team is using these devices to gather and report on such large amounts of sensitive customer data, it is vital that your devices are secure. As for battery life, 49% reported this as a major issue, especially within the larger organisations consisting of over 5,000 employees. In order for you to see an improvement in the productivity levels of your field team, your mobile devices need to be able to cope with simultaneously running the multiple applications that your staff require over long periods of time, without suffering from depleted battery life. The physical robustness of the device was the third most significant issue with 42% of our respondents identifying this as a major concern. If your mobile devices are likely to be exposed to a variety of weather and tough working conditions, there are numerous capabilities your device needs to support, from an outdoor readable screen to seals strong enough to withstand large amounts of dust and water ingress. In addition to these main issues, a number of other concerns came to light when investigating the performance and suitability of consumer-grade devices for business use. Some companies were worried that staff would be able to use consumer grade devices for non-business purposes. This is not only a security concern, but could hinder the productivity levels businesses are hoping to achieve by deploying these devices. Alongside this were additional issues involving warranty support and environmental protection. Ultimately, consumer-grade smartphones cannot be tailored to individual business needs. Therefore, if you do deploy consumer-grade smartphones to your mobile workforce, then you are bound to come across issues because of the range of capabilities required in service, so the question is, will you ever yield a positive return on your investment? To achieve increased productivity, efficiency and customer satisfaction levels, your mobile devices need to be able to support the work of your field team in the environments that they operate in, this can be achieved far more effectively with an enterprise-grade, purpose-built smartphone. Selecting this option will ensure that your device meets all the necessary business requirements and can save you money on add-on and replacement costs in the future, not to mention peace of mind that your data is secure. Contact us today if you want to learn more about your mobile options.